"You can no longer contact this user" is a common message that some chat platforms will send you when a fellow user blocked you. However, you do not get such message from WhatsApp when you send a message directly to someone who might have blocked you. It can be very confusing as you hardly know where the problem is. What can you do to know if someone has blocked you on WhatsApp? This article will reveal some ways to figure out how you can do that, even you are using an iPhone running iOS 12. 1. If you cannot see a contact's "last seen" or "online" status in the chat window, it could be an indication you have been blocked. 2. If a contact updated his profile photo and you do not see it except the old profile picture, it is not out of place to believe you have been blocked. 3. If you see just one check mark (message sent) whenever you send a message to a contact. Generally, two check mark (message delivered) often show if a contact has not blocked you. 4. If you place a call to the contact and it is not going through. You can use the tips above to know if someone has blocked you. However, there is a drawback. Because of privacy, you cannot be 100% sure if you have been blocked since WhatsApp will not confirm that to you. WhatsApp plainly stated that they cannot confirm to you directly, thus you might be in the dark as to whether your contact blocked you or not. This is another method that can be used to find out if you have been blocked. Sometimes, it might just be that the person has not been using WhatsApp for a long period. If that is the case, you may notice one or all of the signs in the strategy 1 above. However, you want to be sure. Therefore, follow the steps below to confirm. Open your WhatsApp and check the contact at least twice a day. Keep checking twice a day for 7 days. If you notice changes in the profile photo, you likely have not been blocked. Keep checking. If you do not see an update in profile photo or it disappears entirely, just know you have been blocked. 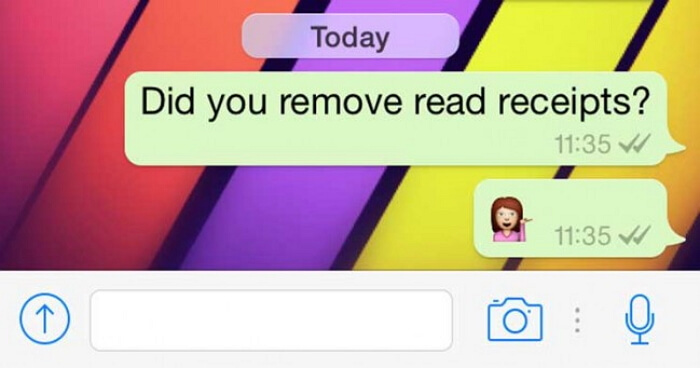 Check again to see if the person uses WhatsApp several times a day and the two marks do not show green color (seen). You might have been blocked if you did not see it upon repeated checks. Another way to know if someone has blocked you is to start a WhatsApp group. The previous strategies and steps above might have left a small room for doubt. If you want to be undoubtedly sure someone has not blocked you, simply start a group. Go to your WhatsApp and start a new group. Look for the contact you thought could have blocked you and try to add the contact to your newly-created group. It should be easy to add the contact straight away if you have not been blocked. You may see a message like "You are not authorized to add this person" if you have been blocked. Using different phone to access your friend's WhatsApp is also a strategy. If someone has not blocked you and you want to be so sure, how may you know? Well, you need to confirm again. The steps below can help. Pick up another phone if you have and open WhatsApp. Look for the contact and try to add. 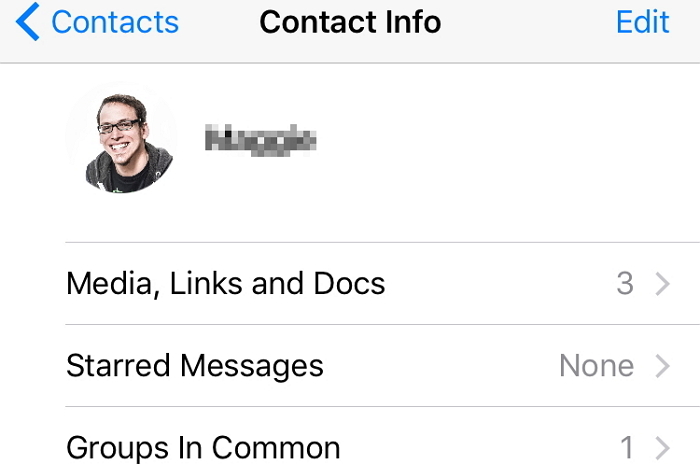 Take note of how the contact's profile appears. Did you see the DP, Last Seen or any details that match with what you saw in your first phone? If all details are the same, it might be that you have not been blocked. Check and if the DP, Last Seen, and other details are showing. If so, you have been blocked. There is yet another method to find out if you have been blocked and that is checking your contact read receipt in the group chat or your private chat. How may you do that? Go to your group chat. Check the contact. Look to see if previous messages you sent show receipt or read with green double check marks. If the double check marks are green, you have been blocked. Check to see if the two check marks are grey, if so you have not been blocked. That is it! All the strategies above can help you know if you have been blocked or not. However, if you were blocked, it could lead to data loss. You do not want that to happen, do you? So, it is imperative to back up WhatsApp data from iPhone to computer. You need effective software to do this and that software is iMyFone D-Port. Developed by famous iMyFone company, iMyFone D-Port is an expert to back up, transfer and export data from iOS device and iOS backups even you are running iOS 12. Has been recommended by lots of technology media sites and Apple users, the software can do more than you expect. See its key features below and remember that it can do much more than the listed. Back Up WhatsApp and Its Media Files: iMyFone D-Port can help back up your entire WhatsApp conversation as well as text, photos, videos, and audio messages. 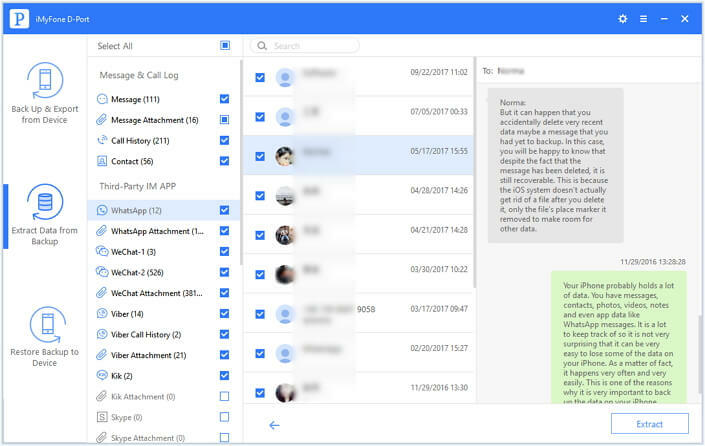 Support Up to 20 Types of Files: Besides WhatsApp, notes, iMessages, call history, Safari bookmarks, WeChat, contacts and many others are supported by iMyFone D-Port. Data Extraction: You can also use iMyFone D-Port to extract data from iTunes or iCloud backups without restoring the backup. Back Up iPhone Selectively (Free): You can backup the whole data on your device or just backup Messages, WeChat, WhatsApp on your iPhone. Click "Back Up & Export from Device", then you will be offered with "Back Up WhatsApp" option. You just need to follow the on-screen guide to finish the backup process. This backup can be restored to your iPhone with the pro version of D-Port which is iMyFone iTransor (supports iOS 12). 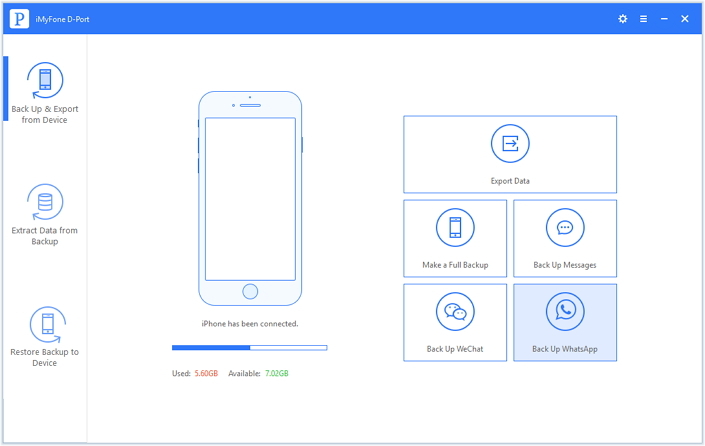 iTransor can backup and restore contacts, messages, WhatsApp, and WeChat. If you don't want to backup WhatsApp data, you can use the program to export WhatsApp chats from your device. Download and install iMyFone D-Port to your device. Launch it from the "Export from iOS Device" tab. Select the file(s) to be exported and click Next. Preview and select files to be exported, and click "Export". Confirm where to store on your computer. Now your WhatsApp data has been backed up to computer successfully and you don't have to worry you will lost you WhatsApp data even you have been blocked. Try all the strategies above to confirm whether you have been blocked for now. And don't forget to try the free trial version of iMyFone D-Port (compatible with iOS 12) to see what it can do for you.